Take a minute. Process the information. Go ahead, let it sink in. OK, ready to discuss? First, should Tim Tebow really do The Bachelor? Of course Tim Tebow should really do The Bachelor! Most NFL players might be worried about the overexposure that a reality TV show would bring, but the world already knows every single thing about Tim Tebow’s life. Honestly, the amount of TV airtime he’d get by going on The Bachelor may not even significantly differ from the amount he got last season, when the Broncos enjoyed an unlikely, Jesus-aided run to the playoffs. And it’s not like there’s no precedent here: Jesse Palmer, the backup QB for the New York Giants, did The Bachelor a whole eight years ago. 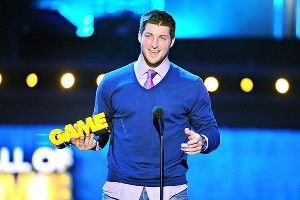 And he wasn’t nearly as deserving as the handsome, upstanding winner that is Tim Tebow. Plus, Tebow’s personal life is already under constant scrutiny. I mean, when a totally innocent dinner with fawn-like country music personality Taylor Swift leads to dating rumors, you know the situation is out of control. You go on The Bachelor, Tim, and you take the narrative back. Two final reasons why Tebow the Bachelor would be a singular joy: (1) Tim’s virginity should make for some sublimely awkward interviews with the ladies vying for his heart in which they try to explain, in PG terms, why exactly they deserve to be his first time, and (2) It’s Tim Tebow! Everything he does is magic! Lastly, can we really get Tebow to go along with this? Sadly, Chris Harrison is right. It doesn’t seem likely. Our only hope? Convince Tim that his verbal “yes” was a binding agreement. Appeal to his sense of pride, and also to his sense of not wanting to be sued by every ABC lawyer all at once. We’ll be awaiting further developments.